Ever wonder what to do when you meet someone who could help with your career? Do you want to learn more about how to make your time and effort pay off? Barbara A. F. Greene, Founder and CEO of Greene and Associates, Inc. will host this interactive workshop and show you how to make the most of the excellent help available from Trinity alumni and how to do more with the other contacts you make. Barbara A.F. 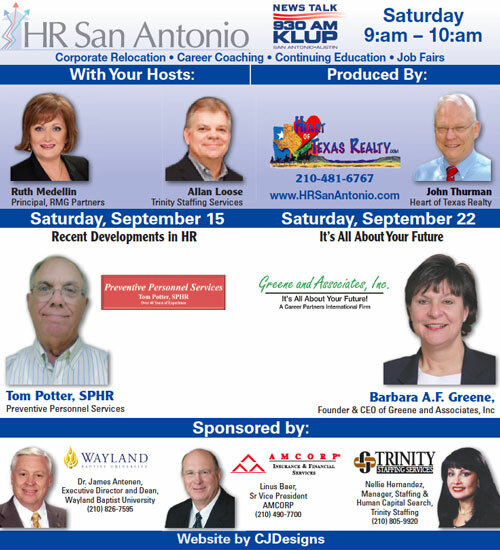 Greene, Founder and CEO of Greene and Associates, Inc., A Career Partner International Firm, will serve as a guest on the talk radio show HR Matters on San Antonio/ Austin’s KLUP radio station. The show covers various Human Resources Topics, and Barbara will be sharing strategies to help you and your organization be more resilient in today’s economy. Tune into station KLUP 930 AM from 9:00 am – 10:00 am on Saturday, September 22nd. Barbara A.F. Greene, Founder and CEO of Greene and Associates, Inc., A Career Partner International Firm, will be serving on a panel for the “Women in Leadership” Forum of the National Hispanic Association of MBA’s (NSHMBA). For this event NSHMBA San Antonio and noted Community leaders will discuss the impact and contributions of women in leadership. This event will be held at the Petroleum Club in San Antonio, and is open to the public. 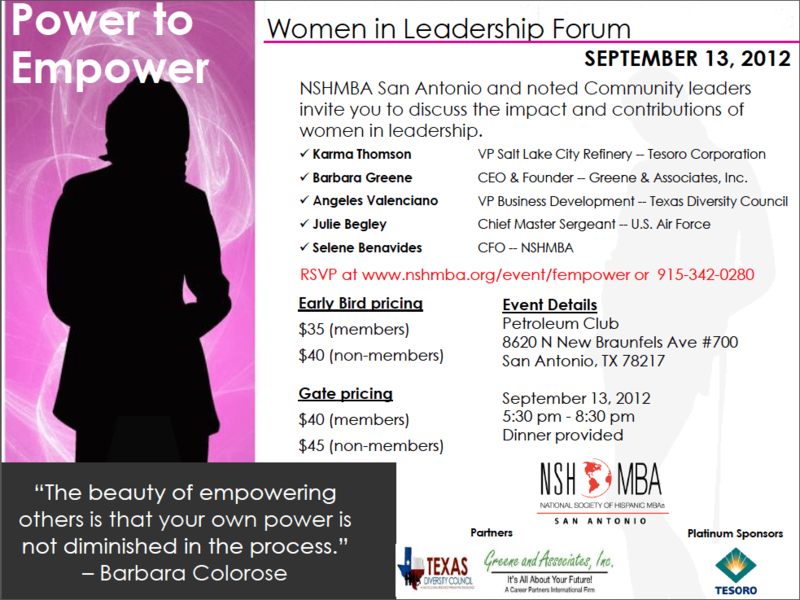 For registration details visit www.nshmba.org/event/fempower or call (915) 342-0280.